Herefordshire is a traditional and ceremonial county and unitary district in the West Midlands region of England in the United Kingdom. It borders the counties of Shropshire in the north, Worcestershire in the east, Gloucestershire in the south east and the Welsh preserved counties of Gwent in the south west and Powys in the west. In 1974 it was merged with the neighbouring Worcestershire to form the relatively short-lived Hereford and Worcester. Within this, Herefordshire was covered by the districts of South Herefordshire, Hereford, and part of Malvern Hills and Leominster districts. On April 1, 1998 it was split out again, in the form of a unitary authority, with broadly the same borders as before. Herefordshire is a very rural county best known for its fruit growing and cider production in particular. When Celia Fiennes visited Herefordshire in 1696 she saw a countryside in which apple and pear trees were growing everywhere 'even in their corn fields and hedgerows'. Modern agriculture has put pressure on the ancient orchards in the county but many of them still survive today providing a habitat for the rare noble chafer beetle. At some time in the 7th century the West Saxons pushed their way across the Severn and established themselves in the territory between Wales and Mercia, with which kingdom they soon became incorporated. The district which is now Herefordshire was occupied by a tribe the Hecanas, who congregated chiefly in the fertile area about Hereford and in the mining districts round Ross. In the 8th century Offa extended the Mercian frontier to the Wye, securing it by the earthwork known as Offas dike, portions of which are visible at Knighton and Moorhampton in this county. In 915 the Danes made their way up the Severn to the district of Archenfield, where they took prisoner Cyfeiliawg, Bishop of Llandaff, and in 921 they besieged Wigmore, which had been rebuilt in that year by Edward. From the time of its first settlement the district was the scene of constant border warfare with the Welsh, and Harold, whose earldom included this county, ordered that any Welshman caught trespassing over the border should lose his right hand. In the period preceding the Conquest much disturbance was caused by the outrages of the Norman colony planted in this county by Edward the Confessor. Richard's castle in the north of the county was the first Norman fortress erected on English soil, and Wigmore, Ewyas Harold, Clifford, Weobley, Hereford, Donnington and Caldicot were all the sites of Norman strongholds. The conqueror entrusted the subjugation of Herefordshire to William FitzOsbern, but Edric the Wild in conjunction with the Welsh prolonged resistance against him for two years. In the wars of Stephen's reign Hereford and Weobley castles were held against the king, but were captured in 1138. Edward, afterwards Edward I, was imprisoned in Hereford Castle, and made his famous escape thence in 1265. In 1326 the parliament assembled at Hereford which deposed Edward II. In the 14th and 15th centuries the forest of Deerfold gave refuge to some of the most noted followers of Wycliffe. During the Wars of the Roses the influence of the Mortimers led the county to support the Yorkist cause, and Edward, afterwards Edward IV, raised 23,000 men in this neighborhood. The Battle of Mortimer's Cross was fought in 1461 near Wigmore. Before the outbreak of the civil war of the 17th century, complaints of illegal taxation were rife in Herefordshire, but a strong antipuritan feeling induced the county to favor the royalist cause. Hereford, Goodrich and Ledbury all endured sieges. The earldom of Hereford was granted by William I to William FitzOsbern, about 1067, but on the outlawry of his son Roger in 1074 the title lapsed until conferred on Henry de Bohun about 1199. It remained in the possession of the Bohuns until the death of Humphrey de Bohun, 7th Earl of Hereford in 1373; in 1397 Henry, Earl of Derby, afterwards King Henry IV, who had married Mary de Bohun, was created Duke of Hereford. Edward VI created Walter Devereux, a descendant of the Bohun family, Viscount Hereford, in 1550, and his grandson, the famous earl of Essex, was born in this county. Since this date the viscounty has been held by the Devereux family, and the holder ranks as the premier viscount of England. The families of Clifford, Giffard and Mortimer figured prominently in the warfare on the Welsh border, and the Talbots, Lacys, Crofts and Scudamores all had important seats in the county, Sir James Scudamore of Holme Lacy being the original of the Sir Scudamore of Spenser's Faerie Queene. Sir John Oldcastle, the leader of the Lollards, was sheriff of Herefordshire in 1406. Herefordshire probably originated as a shire in the time of Aethelstan, and is mentioned in the Anglo-Saxon Chronicle in 1051. In the Domesday Survey parts of Monmouthshire and Radnorshire are assessed under Herefordshire, and the western and southern borders remained debatable ground until with the incorporation of the Welsh Marches in 1535 considerable territory was annexed to Herefordshire and formed into the hundreds of Wigmore, Ewyas Lacy and Huntingdon, while Ewyas Harold was united to Webtree. At the time of the Domesday Survey the divisions of the county were very unsettled. As many as nineteen hundreds are mentioned, but these were of varying extent, some containing only one manor, some from twenty to thirty. Of the twelve modern hundreds, only Greytree, Radlow, Stretford, Wolphy and Wormelow retain Domesday names. The others being Broxash, Ewyas-Lacy, Grimsworth, Huntingdon, Webtree and Wigmore. 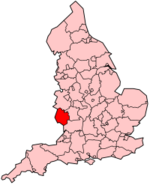 Herefordshire has been included in the diocese of Hereford since its foundation in 676. In 1291 it comprised the deaneries of Hereford, Weston, Leominster, Weobley, Frome, Archenfield and Ross in the archdeaconry of Hereford, and the deaneries of Burford, Stottesdon, Ludlow, Pontesbury, Clun and Wenlock, in the archdeaconry of Shropshire. In 1877 the name of the archdeaconry of Shropshire was changed to Ludlow, and in 1899 the deaneries of Abbey Dore, Bromyard, Kingsland, Kington and Ledbury were created in the archdeaconry of Hereford. Herefordshire was governed by a sheriff as early as the reign of Edward the Confessor, the shire-court meeting at Hereford where later the assizes and quarter sessions were also held. In 1606 an act was passed declaring Hereford free from the jurisdiction of the council of Wales, but the county was not finally relieved from the interference of the Marcher Lords until the reign of William and Mary. Herefordshire was first represented in parliament in 1295, when it returned two members, the boroughs of Ledbury, Hereford, Leominster and Weobley being also represented. Hereford was again represented in 1299, and Bromyard and Ross in 1304, but the boroughs made very irregular returns, and from 1306 until Weobley regained representation in 1627, only Hereford and Leominster were represented. Under the act of 1832 the county returned three members and Weobley was disfranchised. The act of 1868 deprived Leominster of one member, and under the act of 1885 Leominster was disfranchised, and Hereford lost one member. Herefordshire has always been esteemed an exceptionally rich agricultural area, the manufactures being unimportant, with the sole exception of the woollen and the cloth trade which flourished soon after the Conquest. Iron was worked in Wormelow hundred in Roman times, and the Domesday Survey mentions iron workers in Marcle. At the time of Henry VIII the towns had become much impoverished, and Elizabeth in order to encourage local industries, insisted on her subjects wearing English-made caps from the factory of Hereford. Hops were grown in the county soon after their introduction into England in 1524. In 1580 and again in 1637 the county was severely visited by the plague, but in the 17th century it had a flourishing timber trade. and was noted for its orchards and cider. There are remains of several of the strongholds which Herefordshire possessed as a march county, some of which were maintained and enlarged, after the settlement of the border, to serve in later wars. To the south of Ross are those of Wilton and Goodrich, commanding the Wye on the right bank. Of the several castles in the valleys of the boundary-River Monnow and its tributaries, those in this county include Pembridge, Kilpeck and Longtown; of which the last shows extensive remains of the strong keep, and thick walls. In the north the finest example is Wigmore, consisting of a keep on an artificial mound within outer walls, the seat of the powerful family of Mortimer. Beside the cathedral of Hereford, and the fine churches of Ledbury, Leominster and Ross, the county contains some churches of almost unique interest. In that of Kilpeck, Norman work is seen. It consists of the three divisions of nave, choir and chancel, divided by ornate arches, the chancel ending in an apse, with a beautiful and elaborate west end and south doorway. The columns of the choir arch are composed of figures. A similar plan is seen in Peterchurch in the Golden Valley, and in Moccas church, on the Wye above Hereford. Among the large number of churches exhibiting Norman details that at Bromyard is noteworthy. At Abbey Dore, the Cistercian abbey church, still in use, is a large and beautiful specimen of Early English work, and there are slight remains of the monastic buildings. At Madley, south of the Wye and west of Hereford, is a fine Decorated church (with earlier portions), with the rare feature of a Decorated apsidal chancel over an octagonal crypt. Of the churches in mixed styles those in the larger towns are the most noteworthy, together with that of Weobley. The half-timbered style of domestic architecture, common in the west and midlands of England in the 16th and 17th centuries, beautifies many of the towns and villages. Among country houses, that of Treago, west of Ross, is a remarkable example of a fortified mansion of the 13th century, in a condition little altered. Rudhall and Sufton Court, between Ross and Hereford, are good specimens of 15th century work, and portions of Hampton Court, north of Hereford, are of the same period, built by Sir Rowland Lenthall, a favorite of Henry IV. Holme Lacy, south east of Hereford, is a fine mansion of the latter part of the 17th century, with picturesque Dutch gardens, and much wood-carving by Griniing Gibbons within. This was formerly the seat of the Scudamores, from whom it was inherited by the Stanhopes, earls of Chesterfield, the 9th earl of Chesterfield taking the name of Scudamore-Stanhope. His son, the 10th earl, in 1909, sold Holme Lacy to Sir Robert. Main county towns include The City of Hereford, which is the main administrative centre, as well as Leominster, Ledbury, Ross On Wye, Kington and Bromyard. Agriculture has changed massively in recent years within the county. The county is in the west of England which has been historically pastoral as opposed to the east which was more arable. The county is famous for its apple and pear orchards, and of course its Cider. There are many orchards around the county but not as many as there once was. In the last few years soft fruits such as strawberries have become a new and rapidly expanding area of the agricultural economy of the county. One of the main reasons for this was the introduction of the poly tunnel. This allowed the strawberries to be grown for a far longer season as well as producing strawberries of higher quality with no blemishes from the rain. The strawberries are (in the majority) picked by Eastern European 'students' who come over for the season to earn some money, more than they could working in their country of origin. The poly tunnels have been a major issue in the county as some people see them as a 'blot on the landscape'. If agriculture is however to survive then it must be allowed to innovate, otherwise the industry will stagnate and the county will suffer. There was a time when the majority of farms in the county would have had dairy cattle for milk production. The cost of investing in new equipment, long hours, BSE, Foot & Mouth and mainly the falling milk prices have meant that the milk production has drastically reduced, with only a few farms still in dairy farming. As mentioned above the county is historically pastoral. The soils are mostly clay, meaning that large scale potato production was very difficult, as tractors were not powerful enough to pull the large machinery required to harvest the crop. Around the early 1990s new technology and more powerful machines over came this problem. Potato production started to increase, fueled by a few other key factors: The previously pastoral soils had not had potatoes grown in them, subsequently they were not infected with worm, which in the east of England had to be sprayed against weekly (a large cost). Also the clay soil produced an unblemished potato of the highest grade. The intensive nature of the crop meant that potatoes could only viably be grown on a field 1 in every 5 years. This meant that potato growers always needed more land than they had, so rented. This was at a time when the rest of the industry was struggling and in serious decline. Their rents of £300-500/acre (as opposed to normally £80/acre) were very helpful to many farmers in a difficult period. The M50, one of the first motorways to be built in the UK, runs through the south of the county and, with the A40 dual carriageway, forms part of the major route linking South Wales and the West Midlands. The hilly nature of the terrain in Mid Wales means that the main ground transport links between North Wales and South Wales run through Herefordshire. The other trunk roads in Herefordshire, the A49 and the A465, form part of these north–south routes as well as catering for local traffic. These are single-carriageway roads and mean that travelling through the county is often slow. In particularly Hereford is a major congestion point with all traffic having to pass over one dual-carriageway bridge in the centre of town. Subsequently traffic can jam and leave the city in gridlock in rush hour. In times of flood a roundabout on the south side of the bridge is impassable leaving the south of the city almost stranded. ASDA supermarkets is currently building a controversial supermarket scheme connecting to this small roundabout on a flood plain. This project will have large flood defences and the roundabout will be improved and level raised as part of the project. The Welsh Marches Railway Line also runs north - south with passenger trains operated by Arriva Trains Wales offering links to North West and South West England as well as to North and South Wales. Hereford is the western end of the Cotswold Line which runs via Worcester with through services to Oxford and London (operated by First Great Western and FGWL) and to Birmingham and Nottingham (operated by Central Trains). Former routes which are now closed were Ledbury to Gloucester; Hereford to Ross-on-Wye and onward to Gloucester and Monmouth; Hereford to Hay-on-Wye; Pontrilas to Hay-on-Wye; Leominster to New Radnor; Eardisley to Presteign; and Leominster to Worcester via Bromyard. There are no airports with scheduled air services in Herefordshire though Birmingham, Cardiff and Bristol International Airports are all within reach and the RailAir coach operated by First Great Western provides connections from Heathrow via Reading station. Shobdon Aerodrome near Leominster is a centre for general aviation and gliding. Hot air ballooning is also popular with Eastnor Castle being one of the favourite launch sites in the area. Historically, the Rivers Wye and Lugg were navigable but the wide seasonal variations in water levels mean that few craft larger than canoes and coracles are now used. There are canoe centres at The Boat House, Glasbury-on-Wye, the Hereford Youth Service and Kerne Bridge Ross-on-Wye. The early nineteenth century saw the construction of two canals, The Hereford & Gloucester Canal and The Leominster & Stourport Canal but these were never successful and there are now few remains to be seen.